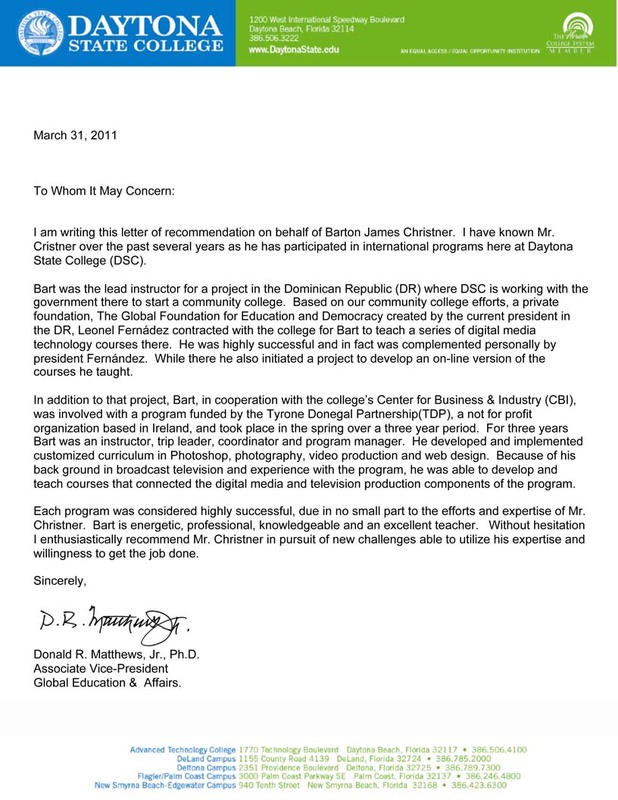 I am writing this letter of recommendation on behalf of Barton James Christner. I have known Mr. Christner over the past several years as he has participated in international programs here at Daytona State College (DSC). Bart was the lead instructor for a project in the Dominican Republic (DR) where DSC is working with the government there to start a community college. Based on our community college efforts, a private foundation, The Global Foundation for Education and Democracy created by the current president in the DR, Leonel Fernádez contracted with the college for Bart to teach a series of digital media technology courses there. He was highly successful and in fact was complemented personally by president Fernández. While there he also initiated a project to develop an on-line version of the courses he taught [eighty, 2-3 minute Photoshop training videos]. In addition to that project, Bart, in cooperation with the college’s Center for Business & Industry (CBI), was involved with a program funded by the Tyrone Donegal Partnership (TDP), a not for profit organization based in Ireland, and took place in the spring over a three year period. For three years Bart was an instructor, trip leader, coordinator and program manager. He developed and implemented customized curriculum in Photoshop, photography, video production and web design. Because of his back ground in broadcast television and experience with the program, he was able to develop and teach courses that connected the digital media and television production components of the program. Each program was considered highly successful, due in no small part to the efforts and expertise of Mr. Christner. Bart is energetic, professional, knowledgeable and an excellent teacher. Without hesitation I enthusiastically recommend Mr. Christner in pursuit of new challenges able to utilize his expertise and willingness to get the job done. Donald R. Matthews, Jr., Ph.D.